The CP-Class of High Performance Constant Pressure Pumps consists of dual headed, positive displacement piston pumps with constant pressure control and a wide range of flows and pressures. Stainless steel is the standard fluid path, while jacketed stainless steel heads for temperature controlled processes or titanium are options. CP-Class pumps are widely used for LC Column Packing, as well as many process applications including the oil and gas industry. Advanced pressure control algorithms insure consistent bed density and prevent pressure over-shoot by allowing the user to select a wide range of parameters, including desired pressure set-point, ramp rate, and upper flow limit. The pumps offer pressure capability of up to 25,000 psi (with a maximum flow rate of 5 mL/min). 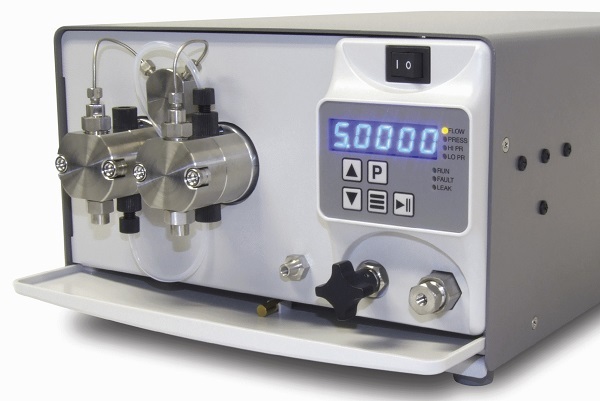 The CP-Class pumps are available as a stand-alone units and also as Column Packing Systems (“Pack-in-a-Box”, call Rose Scientific for more information). Features include integrated Prime-Purge Valves, interactive key-pad control, advanced pressure control algorithms and complete PC control and status through RS-232 and Micro USB 2.0 ports. Standard models are equipped with1/4” -28 flat bottom inlet and 1/16” CPI outlet fittings, but the stainless steel headed pumps can be optionally equipped with 1/8” CPI inlet and 1/16” CPI outlet fittings, 1/8” CPI inlet and 1/8” CPI outlet fittings or 1/4” CPI inlet and 1/8” CPI outlet fittings. Also available are 1/4” -28 flat bottom inlet and 1/4” -28 flat bottom outlet fittings.